Where Do Visitors To This Blog Go To? Where do visitors to this blog go do when they click on a link which published in a blog post? When I looked at the click statistics for the past year I was surprised that the top ten pages, with just one exception, were to the home page of a number of UK Universities: Abertay, Aston, Cambridge, Bangor, Buckingham, Glasgow, ECA, Exeter and Falmouth. I subsequently found that these were the nine of the 26 institutions which had been hyperlinked in a post on Best UK University Web Sites – According to Sixth Formers published in 2010.
twitter.com: I normally provide a link to tweets which I cite. This enables me to find the original source if I wish to make use of it in the future. In addition it will help people reading the post to see the source, see the context and find out more about the Twitter user. It would appear that my decision to do this has proved useful as people do seem to be clicking on links to tweets. opus.bath.ac.uk: It is pleasing to see that links to Opus, the University of bath’s institutional repository, features so highly. These are primarily to copies of my peer-reviewed papers. Interestingly a recent paper by myself and Jenny Delasalle asked Can LinkedIn and Academic.edu Enhance Access to Open Repositories? Although we feel the answer is “yes” it would appear that this blog also has a significant role to play in enhancing access to such papers. iwmw.ukoln.ac.uk: As might be expected there are significant numbers of visits to the Web site for UKOLN’s annual Institutional Web management Workshop, IWMW, since the event is featured on this blog when we issues the call for submissions, when we open the event for bookings, and when we publish reflections on the event. ukoln.ac.uk: As might be expected there are significant numbers of visits to the UKOLN Web site which hosts many of the resources for work which I write about on this blog. It should be noted that visitors do not only follow links provided in blog posts; the blog’s sidebars and navigation bar also buy medications online uk provide addition content and links to resources. 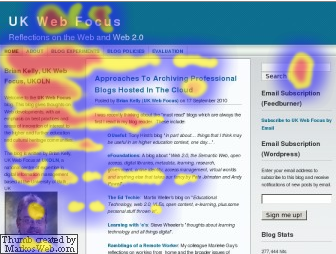 Heatmap – An F-shaped principle of how web-pages are read: two horizontal strips and one vertical. Using this principle we’ve suggested where your visitors’ eyes will first be directed to on the main page. This data can help you in placing the most important site’s blocks in the hottest places. This will help you to increase the site’s traffic and raise profitability. The left hand sidebar provides information about the blog which I feel is important information. However, as shown in the accompanying image of the heat map for a previous design of the blog, although the blog’s search box is likely to be used by people which wish to search for additional posts, the email subscription sign-up area was a waste of space, as this is something people will only do once, if at all. In light of the suggestion that the heat map can help be to locate important content I updated the design of the sidebar in March 2012. The blog now has a Featured Paper area beneath the search box (as illustrated) which summarises a paper and provides links to the paper. The featured paper is updated every couple of weeks. It was not clear to me whether the redesign had any effect on users’ behaviour. Having for the first time analysed the statistics for users clicks it would appear that this redesign has helped to raise the visibility of my papers (it should be noted that the clicks may also have come from links provided in blog posts) . Myself and Jenny are presenting a talk at the Internet Librarian International (ILI 2012) conference to be held in London on 30-31 October which will try to provide an answer to the question: What does the evidence tell us about institutional repositories? The evidence from analysis of the blog’s statistics tells us that the blog delivers significant traffic to the University of Bath’s repository. Given the significant relationship between this blog and the Opus repository it will be interesting to see if the links from this blog have any impact on the repository’s search engine rankings and the visibility of the repository itself, as well as my papers, for researchers who make use of Google to search for relevant information. Perhaps my post which asked Can LinkedIn and Academia.edu enhance access to open repositories? which was republished yesterday on the LSE Impact of Social Sciences blog gave an incomplete view of the importance of social media for researchers seeking to maximise the impact of their work. Maybe it would be a mistake to ignore the importance of researcher’s blog, not just as an open notebook for sharing ideas at an early stage and inviting feedback, but to support the dissemination of existing published work? I took a quick look at the Markosweb site. The heatmap you use implies (to me at least) that it’s an eyetrack study. A click heatmap would have different focus. Given the expense of undertaking eyetracking studies, I would expect that Markosweb have used some kind of automated service. From what I’ve read, these aren’t very credible (http://bit.ly/SXhx5m).